To say that the last 75 days has been a challenge would be an understatement. 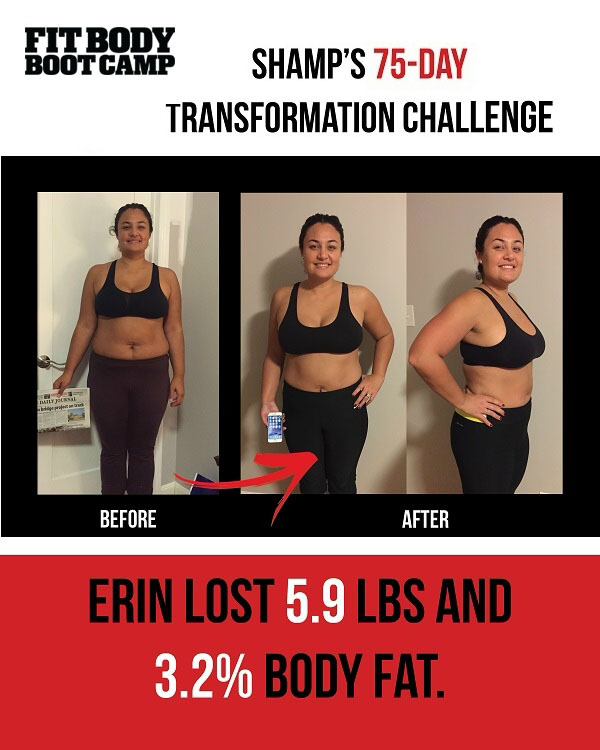 When I first signed up for the 75 Day Holiday Transformation Challenge, I thought that I would spend my time in the gym, 4-5 days a week, and the pounds would magically melt off. In my first few weeks, I was able to make it to the gym for the awesome workouts. I wasn’t seeing my body change as quickly as I had seen when I had completed other ‘transformation’ challenges in years prior. I realized that I needed to start making changes to my diet in order for me to get the best results. I changed my diet to focus on fruits, vegetables, and lean proteins – this was a difficult as we eat a lot of carbs in my house. Approximately 3-4 weeks into the challenge, I unexpectedly found myself traveling for 3 weeks for work. I was at home for less than 24 hours at a time and when I wasn’t leaving on a 6 am flight, I made it to the gym in the mornings. On the road, eating in hotels and at fast food restaurants, I realized that in order to not lose all the progress I had made, I had to place more emphasis on what I was putting in my body. I would seek out healthier restaurants or order the most healthy option available on the menu whenever there was one. Since I wasn’t in the area to make it to the gym, I started working out in hotel gyms and made use of what I had on the road (think burpees and the weekend workouts on yoga mats, taking the stairs to my room on the 30th floor, or walking 9 miles round trip through the city of Philadelphia). When I was home, I would step on the scale – while I wasn’t losing the weight I wanted to lose, I wasn’t putting weight on either. Once I completed this long stint of travel all over the country, I was happily able to return to the gym [Shamp’s Boot Camps]. It was wonderful to have the camaraderie and support of everyone there working out together; and it was great to not have to think about my workout regimen for the day – it was all there on the white board staring back at me each day. It was at this point that I suffered my second major set-back. As I was stretching after a ladder workout, I knew something wasn’t right in my back. I could feel shooting pain as I made small movements. At the time, I had no idea that this would be my last workout at the gym. In the next 5 weeks, I was not been able to exercise, but rather had to take time off from the gym to rest my back, take pain killers and muscle relaxants, and get imaging. I have not yet returned to working out, but I able get some exercise by walking (which is a far cry from TABATA day!). When I set out to do this challenge, I set a goal to lose 20 lbs. While I didn’t meet my goal, I am happy to say that at no point did I gain weight. Throughout everything in the last 2 months, I managed to not “stress eat” or completely give up. I used the tools I learned about at the gym and on the website to be successful. For me this transformation was more than just about transforming my body – it was about transforming my mind. I learned to not neglect myself. I learned that it is possible to be successful when faced with what appear to be extreme challenges. I learned the tools to carry with me for the rest of my life to be a healthier and happier person. And in the process, I managed to lose 6 lbs, 3% of body fat, and a whopping 27 inches from my body! Thank you to all those who helped start me on this path to transforming my life!